Fronczak, Paul Joseph and Tresniowski, Alex (2017). The Foundling: The True Story of a Kidnapping, a Family Secret, and My Search for the Real Me. Published by Howard Books. ISBN 9781501142123. From the publisher's book description: "Paul took a DNA test. The test revealed definitively that he was not Paul Fronczak. From that moment on, Paul has been on a tireless mission to find the man whose life he’s been living—and to discover who abandoned him, and why." 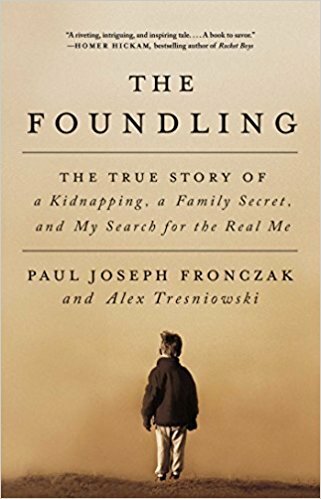 The Foundling is a fascinating and gripping story about uncovering the true identity of Paul Fronczak, an abandoned baby in the 1960s whose unknown parentage case is inextricably linked with a once high-profile FBI case about a stolen baby, using the latest DNA technology and old school detective work. It details the deeply personal experiences of all the people involved in such a search, the sacrifices made, the highs and lows, and the drive to persevere without any guarantee of closure or a happy ending. Paul uncovered his origins thanks to modern technology, the help of several experts, and the luck involved in matching relatives who had also submitted their DNA to genetic genealogy databases and were willing to help. There is a fair amount of detail about the search methods used, without being overly technical. This book should be of interest to anyone undertaking an unknown parentage search.